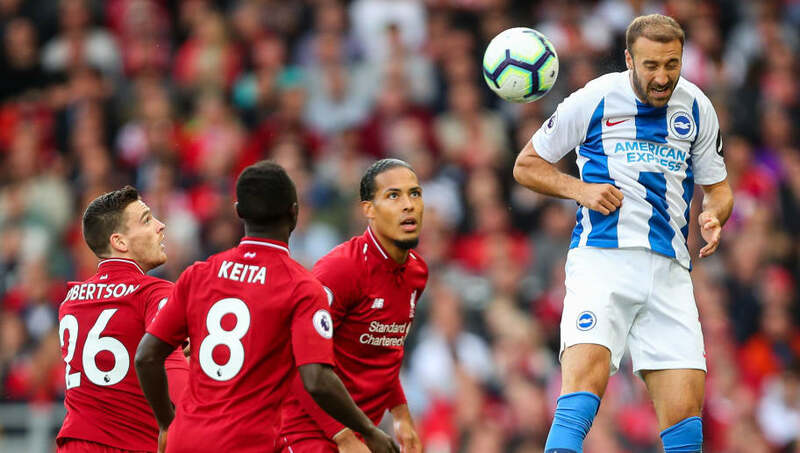 ​Brighton take on Liverpool at the Amex in the Premier League on Saturday, with Jurgen Klopp's table-topping side looking to avoid their third defeat on the row following losses to Manchester City and Wolves in the Premier League and FA Cup respectively. Brighton have largely struggled for consistency this term, though impressive showings against Arsenal, Everton and West Ham have seen the Seagulls take five points from their last three games. ​Liverpool, after an unbeaten start to the season, finally succumbed to their first loss of the season to title rivals City last week and will be desperate to return to winning ways on the South Coast on Saturday. ​Brighton manager Chris Hughton may be forced into a reshuffle at the back with left-back Bernardo picking up a hamstring injury against West Ham, which could see Gaetan Bong return to the side. Liverpool's ​Dejan Lovren was forced off with a hamstring injury just minutes into the Reds' FA Cup defeat against Wolves, meaning Fabinho is likely to deputise alongside Virgil Van Dijk in defence with Joe Gomez and Joel Matip still sidelined. ​Brighton Button; Montoya​, Dunk, Duffy, Bong; March, Stephens, Propper, Gross; Locadia, Murray. ​Liverpool ​Alisson; Alexander-Arnold, Fabinho, Van Dijk, Robertson; Henderson, Wijnaldum; Shaqiri, Firmino, Mané; Salah. In previous meetings between the two sides, Liverpool have emerged victorious 16 times, with Brighton managing to win just four fixtures. Recent results are just as ominous for Brighton fans, with the Reds winning seven of the previous eight encounters between the two. Liverpool have scored 10 times in the previous three league meetings since Brighton's promotion to the Premier League. Brighton's performances have improved as the season has gone on, though inconsistency continues to undermine the Seagulls when they seem to be building a head of steam. Hughton's side have steadied the ship somewhat in recent weeks with two draws and a victory over Everton in the league, and an impressive midweek victory over Bournemouth in the FA cup. Liverpool's unbeaten start to the season was finally brought to a halt by Pep Guardiola's Manchester City last weekend in a crucial fixture between the league's two outright contenders for the title. Hughton's sides are notoriously resolute and well-drilled, though Liverpool this term have shown they are capable of breaking down teams that try and sit in deep against them. Hughto​n may be tempted to have a go and attack a makeshift Reds backline, though Liverpool possess just as much threat on the counter with their pace in attack. Barring any slip-ups, Klopp's side should find victory on Saturday fairly routine to get their campaign back on track.